Also Recommended: Aria, Tamayura, Yuyushiki, Sketchbook ~full color's~. Notes: Based on the ongoing seinen manga by Atto, serialized in Comic Alive. We go back in time again, to when Hotaru Ichijo moved to the countryside to attend her new school. Join us again as we travel through the same season as the first one, looking at those other moments in their lives. Carlos and Tim covered a season I had wanted to watch for the longest time, and it took a release on Bluray before I finally had the chance to experience this gem for myself. And what a gem it was. Non Non Biyori's main charm point is, as Carlos and Tim pointed out, definitely the pastoral settings that the show is taking place in. The interesting part of this is that the show seems to be modeled after what I imagine people from the city might think of the countryside; all quiet and nondescript. Nothing here is within ten minutes by foot reach, nor does public transport run with a frequency that exempts planning when going anywhere in particular. The settings are, of course, gorgeous and has this realistic feel to it that rings true to me, seeing as I, too, moved from the city (the second biggest city in Norway, to be more specific) to the area I live now. (Which is a good deal bigger, due to the industrial parts of my surroundings, but let's not be too nitpicky here.) 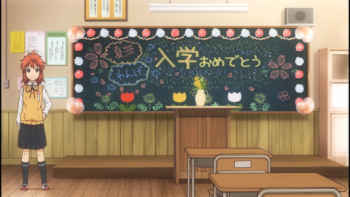 Non Non Biyori also has that "everyone knows your name" thing going on, as most people here know each other, almost by first name, which strikes another chord of familiarity with me. In a modern world, it's hard to familiarize oneself with the sense of quiet this show encompasses to an almost admirable degree. Despite technology certainly being a part of it, there is still a feeling of awareness about the things around you instead of the downright casual worship of the future. People in this show go outside, and aren't often seen with their nose down their phones or web tablets. There are TV shows, of course, but cellphone reception is a variable that goes from one bar to "you're all on your own, kid". In a bit of a depressing view of realism, the school our main characters go to is a pretty dilapidated building, because governments aren't really known to be very supportive of structures and constitutions that aren't cramming its residents like fish in a barrel. And so, the joke becomes "be careful of where you place your feet". Even if it looks fine in scenes that aren't meant to show how run down it is. With technology taking the back seat, the show becomes more of a cavalcade of outdoor activities, and with our charactes mainly being kids, that means they are often found outside more often than inside. 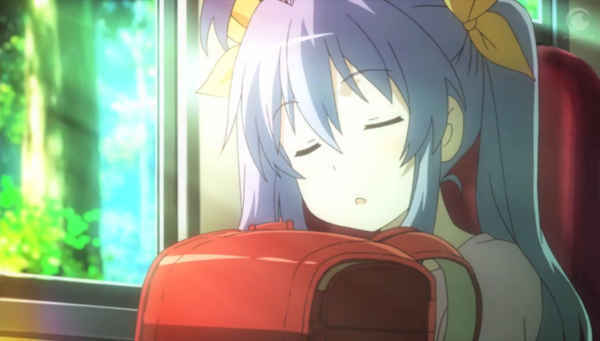 I've never been to Japan myself, mind you, so I can't really say that the almost constantly nice weather in Non Non Biyori is realistic or possibly leaning more towards cautious optimism. As does our characters, who spend a lot of time walking around and exploring the area. Of our four mainstays, I was also greatly amused by the fact that despite the wide age range, their levels of maturity were about the same. Natsumi Koshigaya is supposed to be the oldest one of the four girls, but she's easily the laziest and most irresponsible of the lot. Actually, she isn't the oldest, but that's only because her sister Komari Koshigaya beats her out by one year. Most people wouldn't think so, however, because Komari is pretty short by her age's standards, and she's perfectly aware of that. She is usually the most honestly mature of the girls as long as her complexes don't bubble up to the surface. Which they do. Often. 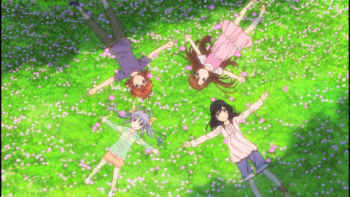 The one who LOOKS the oldest of the girls is Hotaru, but with the exception of Renge, she is actually the youngest. Her sense of maturity is more of an act, but not in the sense that she wants to be seen on as mature as much as her just acting like that because she thinks it's normal to do so. The first season did go into that a little bit, but the second season takes that a few steps further, and it's an unsettling sight to behold. 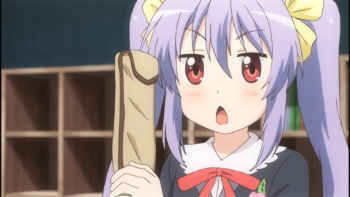 The only one of the lot who generally tends to act her age all of the time is Renge, show stealer extraordinaire. As befits a girl her age (around 7), she's quite precocious and almost endlessly curious about things, and whatever you might think if you see images of her and her deadpan expression and triangular mouth, she approaches life with no restraint whatsoever. 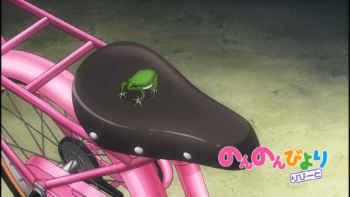 Her observations is what drives most of the charming..est points of the show, particularly when it also involves Candy Store, Renge's name for Kagayama Kaede, the proprietor of the local store. Kaede is, by her own admission, not very fond of kids, but the highlights in the show, including this season, is her interactions with Renge, whom she has formed an endearing bond with. 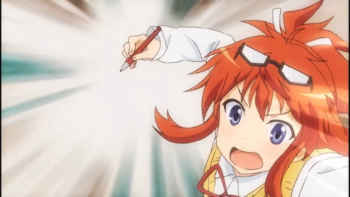 Having seen an astounding amount of quiet slice-of-life shows already, I can safely say that Non Non Biyori is among the better ones, though Repeat's collection of stories and vignettes tends to keep to safe topics like studying, but also arbitrary word jokes that may or may not miss the mark with me. It's still got its comedic timing down pat, but its use of "Repeat" as part of the show title is weirdly appropriate, seeing as a lot of the stuff kind of feels like reruns. It does make a certain amount of sense, given that the time frame for this season is the same as the first one, though unlike Hidamari Sketch, Non Non Biyori don't offer time stamps to help you put the proper timeline together. Basically, it's hard to peg any kind of progress in this show. It's a mild complaint, but it does make this season feel a bit weaker than the first. The show also often pulls some odd themes to base its comedy around, like when one of the girls' friends decided that Natsuki needed to look more feminine, so she dresses Natsumi up in a.... well, dress... and it is indeed the dowdiest, "girliest" thing I have not only seen her wear, but pretty much any of the girls. Except maybe the dress Kaede put Renge in. Jezis almighty, Repeat -- outside of those two examples, I kind of liked the girls' casual wear. This just feels like satirical mockery to me. That said, Repeat certainly still has its moments. 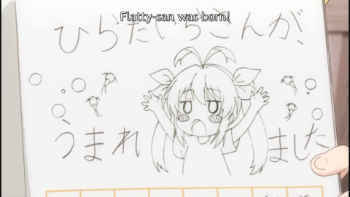 The otherwise kind of stereotypical studying for tests episode ends on some effective gags, and one of the funnier moments in the show period is when Renge, wanting the sun to appear, dresses up as a Teru-Teru Bozu and ventures outside. Repeat also tries for an emotional moment with our favorite child and a repeat of her befriending of Honoka by having her take care of some Tadpole shrimps they picked up from a nearby stream. 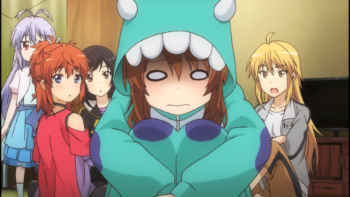 The tale of Flatty-san did not end happily, forcing Renge to deal with permanent loss for possibly the first time, but also allowed Natsumi to show some admirable sides of herself. As much as I want to give her slaps to the back of her head throughout most of the show, she IS able to show considerable amounts of kindness at times, as well as a surprising amount of understanding of how Renge feels. 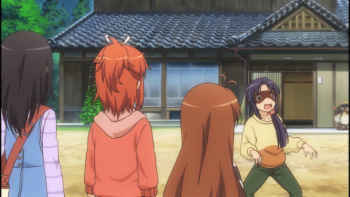 As such, Non Non Biyori and this sorta-sequel fits nicely into the family of slice-of-life shows I've grown to love. Whether I'm less excited about this season or not, in total, it's still a journey through some lovely scenery that, despite its romanticisation of the countryside, does not mock either side of the city/country border. It's funny and it's endearing -- between the first season and this, I'm very much on board with Carlos and Tim's excitement over the first season. 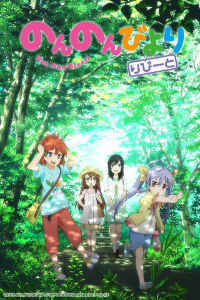 Non Non Biyori Repeat © 2015 Silver Link.